Downloading map files is very slow. It runs about 2kb/s for me. Other files from server downloads about 200kb/s, so its NOT caused by my connection. When map is downloading, no informations are recieved from server, and it keeps like that for about next 10 or more seconds after map download finishes. This doesnt happen when downloading other files. up to 9 of 10 map downloads causes this problem for me. Sorry, with "no informations are recieved" I mean its in "lag"
When server uptime is more than +- half an hour, download is fast. And when I turn server off and on again, its slow again. Did this particular problem start in server r3834 ? With r3834 it's very random.. sometimes maps download smooth and fast, sometimes it freezes at start and then it continues donwloading smooth and fast, and sometimes it just freezes and the download is slow. server parses .map files, creates elements and so syncs this data with all clients. "Sync data channel" always busy, that is why large sync packet downloads with random speed. While this large packet downloading, other sync data like chat messages is waiting. That is why chat is freezes while you downloading map data sync packet. "Download data channel" is not busy in any time, that is why all client files downloads fast. Server-side files download so slow, before, it was fine. Also, I experienced slower download server and client-side since 1.3 (since 1.1 to be honest, but it wasn't that important). diegofkda: Problems with resource downloads are a separate issue. It is vital not to confuse the two. Someone suggested using the web server to transfer this data, which could be worth looking at. 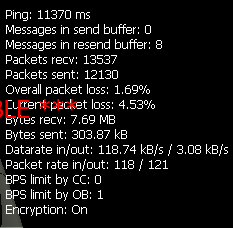 So it seems like server has problem with resending lost packets, maybe? I still get some little random freezes at map download, and I have some packetloss too. Confirmed, net_type 4 increases the download speed and there aren't any 2KB/s downloads anymore.